here's my first quilt label in action. it was hard to write on. after two big fails on the slippery linen, i ended up using masking tape to tape it down to my table and i'm still not super happy with the final writing but i'm sure it's one of those things that will get better with practice. and yes, i've decided to start numbering my quilts, which meant i had to go back through my photos and try to figure out how many quilts i have finished. apparently, thirty three! now thirty four. that seems like such a high number to me, i somehow don't remember making that many quilts. probably because they are just too darn fun. 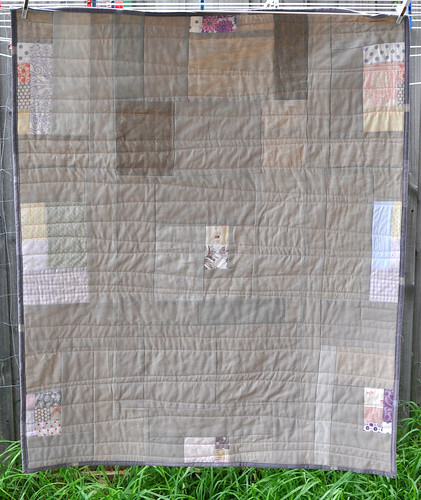 edited to add: i just had a quick look back and realised my very first quilt was made almost exactly three years ago, on may 2, 2008 - what a strange coincidence! Sheesh, that quilt is amazeballs! I might have to put one on my want list. If the linen is hard to write on, maybe you could stamp it? A nice little red 35 could look really good. Lovely to see you back quilting. Leslie not Lesley, sorry I'm on iPhone still and my spelling is slacking off. PS: Have you tried putting sandpaper under a fabric to hold it whilst writing on it? SOOO beautiful Leslie! AND....I'd love to catch up before you head to Canada - we're hoping to get there asap too but for now, I need to live vicariously through your travel plans! 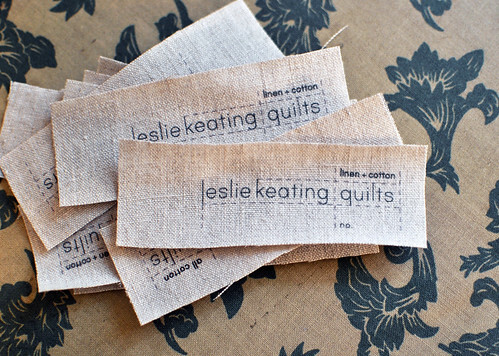 Just beautiful Leslie, I love it - I'm a big big fan of linen and your labels look great too! just so nice. i want to do a plain coloured one, well not plain - i mean tonal. well you know what I mean. your labels are still looking the goods on all my, sorry my kids sofites. but i have to say - im not much of a regular washer...of toys that is. 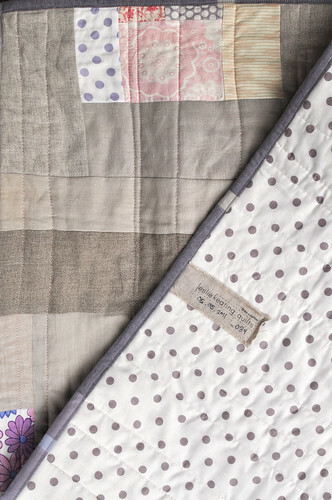 really love this quilt... it's divine. Truly gorgeous Leslie! Love the simplicity of the quilt, and the tags are very clever. Love the idea of numbering them. Wonder how many more you will do this year..? This is stunning. I am so in love! This is just an all around wonderful quilt. I love the soft colors and minimalist design. And the quilting is perfect. Even though it is new, it has a beautiful old-time quality to it. Simply beautiful! This is beautiful! I'm honored to be featured with you talented ladies! I love this. I want to make a modern looking quilt for our queen bed, but something that won't compete with our art deco wallpaper. I think something like this would be wonderful! Elegant but with that homemade-homespun look to it. Thanks for inspiring! !